We are writing to invite you to share your expertise and perspectives about interpreting and interpreter education. 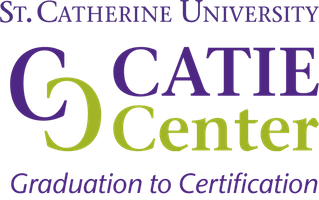 The CATIE Center at St. Catherine University has a federal grant (U.S. Department of Education, Rehabilitation Services Administration H160C160001) to increase the number of certified interpreters and to reduce the average length of time it takes for novice interpreters to become nationally certified. To achieve these outcomes, we are tasked with developing, piloting, evaluating, and disseminating evidence-based practices for supporting recent BA graduates in their entry to practice. During our development process, input from stakeholders including educators, researchers and mentors, is vital. We are contacting you because of your knowledge, expertise, and experience, and hope that you will consider participating as an advisor, in one (or both) of the following roles. Engage in two 45-minute 1:1 conversations with a member of our development team. We will share a summary of our thinking to date and gather input from you that will help us shape the project’s development. We would send you some additional information about the program to review in advance, as well as questions we’d like to discuss. In the fall, we anticipate hosting an online roundtable that would be open to interested educators, mentors and stakeholders. As an advisor in one of the above capacities, your input will help us develop that opportunity for the broader field. We value your input and can provide an honorarium for your participation as an expert advisor. Think Tank on Learning: You would read Make It Stick, consider some questions and then participate actively in an online discussion from June 19-23 (Honorarium of $400). Please let us know if you would be interested in serving as an advisor in either of the capacities above by May 10. If you have any questions before committing, please also contact us. We look forward to your response. This project is funded by the U.S. Department of Education, Rehabilitation Services Administration CFDA 80.160C. Although the contents of this invitation were developed under a grant from the Department of Education, these contents do not necessarily represent the policy of the Department of Education, and you should not assume endorsement by the Federal government.